Many years ago, a friend of David Bridgeman-Sutton recalled that very few women had joined the early ranks of cinema organists (see Harry Remembers 4). There were social reasons for this; pioneers Florence de Jong, her sister Ena Baga and sister-in-law Celeste (delicious name!) had been more adventurous than many. They had strong family associations with the live theatre and all had played in pit orchestras. Another woman from the entertainment world who was quickly at home at the console was Doris Lamb whose formidable array of diplomas and talents enabled her to appear as pianist, organist, violinist and singer – though not all at the same time, of course. A delve into the records shows that a number of other women decided to defy convention and enter what was then an exciting new world. 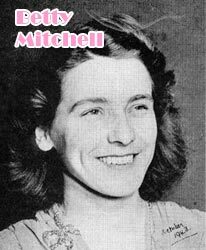 Two of them - Betty Mitchell and Doreen Chadwick - were born at the end of the first World War. Too young to join the first wave of theatre organists, they made up time in the immediately pre-war years. Betty Mitchell persuaded the Manager of a Coventry cinema to let her try out its Wurlitzer. Impressed, he mentioned her name to other managers and she became a regular relief organist at a number of Midland theatres. The war years saw her move to London, where she became resident at a succession of suburban cinemas. 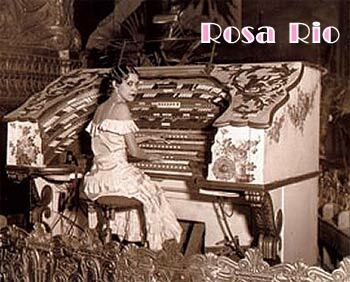 By 1944, she was resident organist and assistant manager at the Regal Norwood. This appointment ended when an incendiary bomb hit the theatre: a fireproof curtain saved the building from extensive damage but the organ was destroyed. The organist, mercifully unharmed, moved on to other theatres. 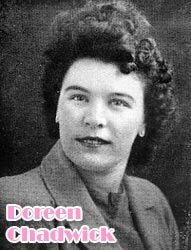 Doreen Chadwick made a mark for herself when she won the solo organ competition at Carmarthen Eisteddfod. A little later she triumphed in a similar contest at Reading, where she added a gold medal to her “bag”. Not surprisingly, she was offered a post at her local theatre in Wales. Later, deciding to try her luck in London, she joined the Granada circuit, eventually becoming resident at their flagship Tooting cinema. Another gold-medallist was Rosalind Clynes. Her award was for her performance at an all-Ireland piano competition: she was sixteen. A scholarship then enabled her to study piano and organ at the Royal Irish Academy of Music. Appointed to the Savoy, Dublin, she became the first woman theatre organist in Ireland. This career might have been short-lived for she married a doctor and settled down to the demanding business of organising a practice and raising a family. At the outbreak of war, she moved to North Wales and was persuaded to play at local cinemas. She quickly became a star-attraction with the Odeon circuit and moved to London (Very few people could have claimed to have been evacuated from Dublin to London for safety reasons!). Her appointments included a residency at the Odeon Leicester Square with its famous – and still extant – five-manual Compton. Also a well-qualified performer was Molly Forbes, who gained LRAM ARCM diplomas at the age of 18. Teaching piano didn't bring to her life the excitement she craved. Encouraged by charismatic Al Bollington, she developed a career as a cinema organist and in fact succeeded her mentor at a large London theatre when he joined the armed forces. Dagmar Elissen, from Denmark, made a series of appearances in the UK in pre-war years. A number of theatre installations had been carried out in her homeland. These were mainly by Wurlitzer though Marcussen had built an instrument for the Danish Broadcasting Company (perhaps they would prefer not to be reminded of this!) Dagmar seems not to have performed in the UK after the war, which, happily, she survived. Rustling through piles of old cinema organ programmes – and sneezing at frequent intervals as clouds of dust arise – one comes across other names that ring long-forgotten bells in the memory. Louise MacDonald, who had qualified at the Royal Manchester College of Music, spent some years teaching before taking up the organ; Elsie Granados, a professional pianist, “converted” to the early Hammond organ at London's Langham Hotel before joining the ABC theatre-circuit as touring organist and Edna Collier who confined activities to her native County Durham where she was deservedly popular. After a short post-war Indian summer, the cinema organ world went into decline as managements made economies in the face of dwindling audiences. Organs were no longer maintained and organists learned the realities of redundancy the hard way. Many of them had to earn their livings elsewhere. The development of a concert circuit, built round instruments rescued from cinemas and housed elsewhere as well as on electronics installed in pubs, clubs and restaurants offered demanding work to those determined to play on. Doreen Chadwick and Molly Forbes joined this circuit - Doreen has made appearances very recently. * The number of young players who have joined them suggest that both Ladies - and Gentlemen - will be at the console for many years to come. *Footnote, 2018: Doreen Chadwick died in June 2014, aged 95. Note: Illustrations are from publicity material over sixty years old – hence the wear and tear. These pictures are believed to be in the public domain, but if this is not the case we would appreciate being told so we can remove them.